The following article is the text of a talk given by the author at the Marxism 2008 educational conference in Auckland. The conference was organised by the Workers Party. The author, a leading figure in the no longer extant WP, was debating Brian van Dam of Workers Charter, a supporter of immigration restrictions. We are continually told by media pundits and academic commentators that we live in an age of “globalisation”, an age in which borders and nation states are becoming increasingly irrelevant faced with the onslaught of giant transnational corporations as well as supranational bodies such as the IMF, WTO and United Nations. To some this age of globalisation in which we are supposedly living holds the promise of a rosy capitalist utopia – to others though it portends nothing but misery and deprivation for the mass of working people. But when people talk about globalisation what do they really mean? Is it really the case that in the 21st century the nation state is no longer essential to the functioning of the capitalist system? Today I’m going to argue that beneath all of this superficial rhetoric about globalisation the nation state is still in fact every bit as crucial to the maintenance of the capitalist system as it was in the nineteenth century. But before I do so I want to provide a quick historical overview of the origins of the nation state particularly in the New Zealand context. The establishment of capitalism in New Zealand was inextricably bound up with the construction of the nation state. The acquisition of this country and the construction of the New Zealand state required the brutal displacement and dispossession of a wide variety of pre-capitalist national identities – in the form of Maori tribal and sub-tribal groups – and their forcible incorporation into a national capitalist economy producing for the domestic and world market. In order to give the newly emerging New Zealand capitalist class (transplanted largely from other parts of the British empire) total control over their own domestic market and to build support for their modest imperialist forays into the Pacific, however, a strong national identity based around a common language and a common set of values or myths was also required. These national values or myths were arbitrary and imposed from on high by the capitalist class. The main architects of New Zealand nationalism were the first Liberal Government, who coming to power in the 1890s at a time when the first signs of class conflict were beginning to emerge in the form of growing industrial unrest, implemented a series of major land reforms to try to encourage the formation of a “sturdy yeomanry” i.e. small landholders. In fact, the idea of creating a nation of small landholders actually owed much to the original colonising scheme of Edward Gibbon Wakefield, who was keen to create in New Zealand a society in which class consciousness would be kept from interfering with the process of capital accumulation. The extent to which the authorities went to discourage the formation of urban proletarian class consciousness can be seen in the fact that the first state housing schemes created under the Liberal government deliberately shunned tower blocks in favour of cottages on quarter-acre sections in which working class tenants could become in their own way small independent producers. The maintenance of Maori tribal reservations in areas such as Northland and the East Cape performed a similar ideological function, in that Maori were not fully integrated into the working class but instead remained part of the permanent reserve army of labour. For similar reasons, the Liberals under Richard Seddon acted to make all trade unions dependent on the state through the Industrial Conciliation and Arbitration Act, with workers giving up the right to strike in return for the promise of regular orders for wage rises. Meanwhile the introduction of a “White New Zealand” policy aimed to reinforce the idea that workers had more in common with their capitalist masters than with the international working class. The White New Zealand policy was mainly directed against the Chinese, who were demonised by bosses and trade union leaders alike as a “yellow peril”, threatening to undermine the so-called “New Zealand way of life” with their insistence on living all crowded together, practicing in their own beliefs and customs and speaking an alien language. Ironically, at the same time that the colonial government in New Zealand was levying a poll tax on Chinese they were encouraging mass immigration from Europe and Australia. Thus the origins of New Zealand’s immigration policy were grounded entirely in simple racist prejudice. What was important to the architects of the White New Zealand policy was not so much that the Chinese were kept out (since capitalist employers could always find a use for their labour) but rather that they be only allowed in as temporary “sojourners” (forerunners of the Pacific Island workers who were brought here in the 60s and early 70s) and that the European Pakeha workers remained bound by ties of nationalist patriotism to the state. Meanwhile all sorts of excuses were manufactured by the trade union leaders about Asiatics coming to steal “our jobs”. The fact that throughout this period mass wages continued to rise, despite mass immigration by workers from all parts of the British Empire, was conveniently overlooked or, if it was acknowledged, dismissed with the racist assertion that “Asiatics” were somehow different as they were accustomed to working for lower wages. So much for immigration controls being guided by progressive ideology, but what about import controls? Historically in New Zealand we can see that whatever trade policy successive governments have pursued, the underlying goal has always been what will best serve the interests of capital. Thus today New Zealand, together with the rest of the club of advanced capitalist nations who control such bodies as the IMF and WTO, looks to aggressively impose free trade upon countries in the developing world, because NZ capitalists have now outgrown the stage of primitive accumulation behind protectionist trade barriers and are now looking for new outlets for investment. Does this mean though that as some trade unionists such as (NDU national president) Robert Reid have recently suggested, the left should make common cause with the struggling small NZ manufacturers who are opposed to the free trade policy currently pursued by their larger capitalist brethren? A return to protectionism, after all, might help to alleviate the decline in manufacturing jobs which have recently been disappearing in their thousands from cities and towns around New Zealand. But the cost of economic nationalism is that it encourages workers to identify not as part of an international working class but first and foremost as members of their own nation state. That’s why, although a policy of tariffs and export subsidies may be fine for reformists or for revolutionary leftists in neo-colonial countries such as Venezuela, in imperialist nations such as New Zealand open borders – not protectionism – is the only viable option. Being in favour of open borders does not mean however that we think job losses brought on by capitalist firms closing down or relocating to low-wage countries should simply be accepted. Rather we as revolutionaries would argue that instead of calling on the state to subsidise these local capitalists to keep jobs in New Zealand that the businesses should be taken over and run by workers themselves. The case for open borders with respect to immigration is even more straightforward, as the arguments against it unlike those of free trade have absolutely no empirical basis. The idea that there are only a finite number of jobs and a finite amount of variable capital which is locked up in a special “wage fund” is an old myth which Karl Marx himself demolished in his polemic against Ferdinand Lassalle, the founder of German state socialism. Marx explained that Lassalle’s so-called “iron law of wages” was based on the incorrect assumption that the level of national production always remained constant, and that the ratio of wages to profits, or as we Marxists like to say between wages and surplus value, also did not change. It should be fairly clear to even the most unstudied observer that variables such as migration, investment in plant equipment and machinery and education would all act to change the magnitude of national production. Moreover, the actual ratio according to which this national production in its monetarised form is divided between workers and capitalists is dependent on three things – the cost of reproducing labour power (the cost of providing the worker with all the basic necessities of life), the size of the reserve army of labour (the unemployed), and the level of class struggle. As I’ve just explained, it cannot be assumed that an increase in immigration will simply lead to growth of the unemployed since production is never constant. Unfortunately this doesn’t seem to stop ostensibly progressive people from buying into the argument that there “simply aren’t enough jobs to go around”. In the present day, opponents of open borders are perhaps less crude in terms of expressing racial bias, however despite the fact that since the 1980s New Zealand has stopped using race as a criteria for immigrants entering the country the fact remains that our immigration policy is still heavily racist, as the current set of primarily economic criteria are far more likely to be used to exclude people who are from the largely non-white imperialist neo-colonies of the Third World. In summary, socialists should support open borders because to do otherwise buys into the myth – heavily propagated by capitalist apologists since the time of Malthus – that the causes of poverty and hunger are caused by material scarcity instead of a failure of capitalism to ensure proper distribution (although even if this were the case, it would seem rather coincidental that those people who were deemed “surplus population” should invariably happen to live in Third World countries and not Western ones like New Zealand). Even worse, in buying into the capitalist rationing argument we are in effect saying that workers are too weak and powerless to defend their own interests, and require the benevolent intervention of bourgeois governments to defend their jobs. Instead of import tariffs and immigration quotas we as revolutionary socialists call for the expropriation under workers’ control of all businesses threatened with closure or mass redundancies, and a concerted campaign to organise all migrant workers on union pay and conditions. While such a course of action may not seem “realistic” or in accordance with bourgeois notions of “common sense”, it is in fact only by pushing for this strategy of open borders that the working class can achieve its own sense of agency and autonomy and thus be said to be truly free. * More recently, McCarten has shifted rightwards and is now chief-of-staff for the leader of the capitalist and anti-immigrant Labour Party he once denounced – Redline. In today’s NZ Herald there is a very interesting report on a study by two Wellington economists which casts some serious doubt on the widely-held notion that new immigrants to NZ are to some degree responsible for the current unaffordable level of house prices. So much for this particular immigration myth. Previous Austerity – has it really worked for the capitalists? Cheers, several small typos. Should be fixed now. It’s interesting what so much of the left choose to campaign on – left-nationalist economic stuff, state capitalist economic stuff. But open borders, which is a fundamental *political* issue what workers need to champion to be ideologically independent of the ruling class and all forms of capitalism, is left aside. 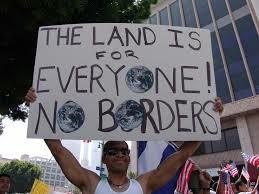 One of the key platforms of a new left has to be open borders, and it would have to be campaigned around.